When I first encountered Galaxy Magazine (I had picked up the April 1977 issue on a whim1) it was only three years away from its final issue2. Of course I had no idea that it was doomed, nor that the issue I selected was the product of something of a renaissance for the magazine, thanks to editor Jim Baen. That first encounter was satisfying enough that I bought newsstand copies until the demise of the magazine made that impossible. How does the issue stand up two generations later? Sun-Planet is a vast artifact built by a long vanished race, coveted by both humans (and their allies) and their enemies, the Perfidisians. Currently held by the humans, settled by the genetically engineered setties, Sun-Planet is on the verge of falling back into Perfidisian graspers. This presents a human functionary with a difficult problem: trust the setties not to cooperate with the Perfidisians or use a bio-weapon to eradicate the setties and so end the threat that they will provide the enemy with Sun-Planet’s secrets. Oh, genocide. Is there no problem you cannot solve? Time has not necessarily been this story’s ally. For example, remember how society used to feel about southpaws? Green felt his stomach muscles tighten. He wasn’t used to such familiarity, especially about his personal problems. “How did you cure it?” he asked. “Still a lefty,” he said. Therapy had been available on almost every world Green had lived on, but something had prevented him from seeking outside help. The gender relations are pretty 1970s: women can be competent, but they must be affiliated with a man; the story is careful to explain to just who belongs to whom. Humans come off as monumental assholes in this story, thanks in great part to their treatment of the setties. The setties were created as tools, using genetic material salvaged from long-extinct cetaceans. They were designed to reject mutations that might lead them to evolve away from their intended role. They are targeted for extermination the moment it seems as if they might switch sides. How unusual, therefore, to discover that the humans in this story are paranoid genocidal assholes. The author isn’t a fan of the usual “well, sometimes mass murder is the only reasonable solution” moral. An interesting fact about this story (something of which I had absolutely no memory) is that Bear provided the art as well as the text. An encounter with an amnesiac visitor ends badly. A covert operative (enmeshed in a three-sided struggle between empire, colony, and separatists) struggles to overcome institutional paranoia in time to save Earth from the alien armada that annihilated the Vega colony. There really is no excuse for a habitable world orbiting Vega in a story published in 1977. Notable mainly for the enthusiasm that two of the three factions display for torture as a means of interrogation. I note that their reaction to getting answers that differ from the ones they want is to double down on the torture, not to consider that they might be wrong. Also notable is that the answers they’re sure must be the correct ones are in fact wrong. And here we are at the only part of the issue that I remembered and the main reason I sought it out. Pournelle’s essay begins as an unduly optimistic take on the American Space Shuttle, which he seems sure will be the DC3 of orbital launchers. Pretty stock stuff for the period. What isn’t stock is the foray into rocket science and orbital dynamics that follows, in which Pournelle provides actual equations with which any moderately bright kid armed with a slide rule or an HP-25 could play. At that time I did have access to various non-fiction books on rockets and rocket science, but this was the piece that made the details click. I spent hours computing simplified orbits. Indeed, it is this essay (and perhaps a few others like it) that implanted my jaundiced view of space perverts, that is, enthusiasts whose fervor to dream the dream is fuelled by their refusal to math the math. Thank you, Jerry Pournelle. A clone-daughter runs off to join the circus, urged by profound paranoia. She’s not so sure about her genius mother’s true intentions for her. The conventional response: this must be teen-aged angst; the proper course of action is to return the poor girl to her loving mother. A simple rule of thumb I find useful: if a clone claims that their purpose is to supply parts for the person from whom they were cloned, believe them. It seems that circus freak shows were still operating, or at least remembered, in the 1970s. The story does take pains to note that prenatal testing and legal abortions have meant that there are fewer and fewer so -called freaks to display. No shortage of gawkers, however. No, wait, something else I remembered, despite the inexorable passage of years. Spider Robinson embraces the zeitgeist (the one that led to Analog’s Special Women’s issue) and devotes the column to women. In pleasant contrast with the Analog issue (about half of which was written by men), all of the pieces mentioned are actually by women. Who are called women, not girls. There were too many dudes in those days (the 1970s) who referred to women as girls but not Robinson. Reviewed are Pamela Sargent’s Cloned Lives, Chelsea Quinn Yarbro’s Time of the Forth Horsemen, Suzy McKee Charnas’ Walk to the End of the World, Vonda N. McIntyre’s The Exile Waiting, Octavia E. Butler’s Patternmaster, Pamela Sargent’s More Women of Wonder, Vonda N. McIntyre and Susan Anderson’s Beyond Equality, Kate Wilhelm’s The Clewiston Test, Zenna Henderson’s Pilgrimage, Zenna Henderson’s The People: No Different Flesh, and Marion Zimmer Bradley’s The Bloody Sun. Some he likes, some he finds flawed, and some he hates, for reasons anyone familiar with him should be able to predict. It’s all done in a folksy, we’re-all-part-of-the-club style that I now find grating. But note that there are details that stuck with me for forty-one years. I was also impressed that he admits to the possibility of that he has misread something he reviewed — when rebuked by an author of sufficient stature, true, but still, admitting error is hard for anyone, any time. I guess I read it wrong, and I fully intend to go back and read the book a second time. This wasn’t the only time Robinson admitted that he might have been wrong. Other reviewers might want to consider his example. Not me, obviously. What I found fascinating and sometimes disheartening is that one could elide a few period-revealing details and publish the essay today … and it would still be relevant and entirely plausible as something that someone involved in these discussions might say. Robinson admits that male authors outnumber female authors in the SF field, but he is certain that prejudice against women cannot be the explanation. After all, no woman has ever told him that she lost a sale due to prejudice. (I suspect that he was also loath to admit that fen can be prejudiced.) He is equally certain that the problem is not that women are incapable of writing publishable science fiction. His treatment of the issue is rather Eric Leif Davin-esque … except that Robinson does think there’s a shortage of women getting published and that this is a problem that needs to be addressed. He blames structural barriers that impede women’s writing careers more than men’s. Specifically, supportive spouses can be key to the process of establishing oneself as a writer without starving. Husbands, he asserts, tend to be less supportive of spousal careers than are wives. I can correlate the number of women who achieve publication with the changes in editors at specific venues: Ben Bova, for example, bought far more work by women than his predecessor John W. Campbell, Jr. and far more than his successor, Stanley Schmidt. Similarly, the fraction of women published at Magazine of Fantasy & Science Fiction declined from a high of 40% under Rusch to a low of 17% under van Gelder. When we take that into account, it is impossible to accept that some editors are less likely than others to buy from women. However, I have the aid of a computer and various literary databases, tools which did not exist when Spider Robinson was writing. So there is some eensy-teensy microscopic justification for his conclusion. Robinson’s hypothesis (that husbands are as a class unsupportive) seems to be a testable one. A possible test: compare female authors married to men with female authors married to women. Who publishes more and longer? This is the sort of thing that those of you with tenure and legions of graduate student minions should look into. Or perhaps someone already has looked into this and I have merely overlooked their work. What would lead a man to commit murder? As it turns out, not every craftsman appreciates having their field disrupted by an innovator. Unfortunately, research is replicable and by explaining his reasoning, the murderer has revealed that the innovation is possible…. I miss Sheffield. I really need to review more of his material. energy needs before the year 2010. Just change 2010 to, oh, 2040. Easy. I find the ads in old magazines delightful. Galaxy April 1977 does not disappoint. 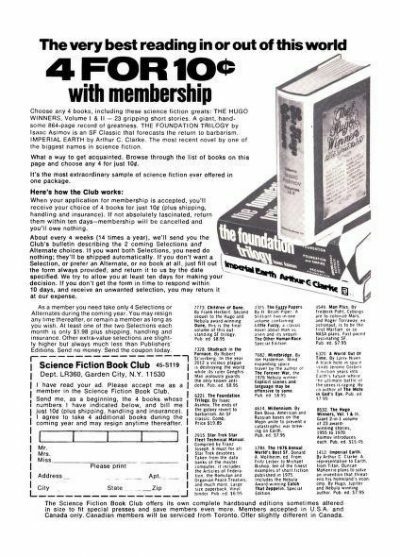 Not only do we find the standard ad for the Science Fiction Book Club3. 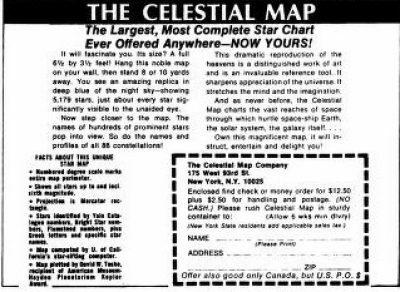 but we also see this ad, which reminds me how lucky I am to live in an era where this sort of information is a click away. I don’t know that this issue would appeal to modern audiences, but for me it was an interesting visit to times past. Galaxy April 1977 is available here (Internet Archive) at in a variety of formats, each format annoying in its own way4. 1: I risked the purchase because I’d earlier picked up a copy of Analog and liked it. Perhaps I would like the competition too. 2: There was a 1990s revival of the magazine that I never saw. 3: As late as ten years ago, people were still responding to those 1970s era (and older!) SFBC ads, forcing long suffering staff to explain that no, just because one had access to generations-old ads, one could not still get four brand-new hardcovers for a dollar. And not that particular selection of hardcovers, since they were long out of print. 4: If anyone has suggestions about how to read portrait-style double-columned pdfs on a laptop screen that is by its nature landscape that would allow me to side-step having to scroll up and down over and over, I welcome them. Putting Pournelle's politics aside, he made a lot of basic errors of science. But OTOH yeah, he published articles with equations and math in them, which right away put him above the 50%th percentile. Other-other hand, Poul Anderson was as good, and Hal Clement, Willy Ley and Isaac Asimov were better. I would be a lot less glowing about A Step Farther Out. I'm considering a piece on asinine tropes I'd like to see go away, stuff based in fundamental scale errors, and that idiotic essay about terraforming Venus would no doubt feature prominently. This specific piece (or at least the orbital dynamics bits) and Those Pesky Belters, though, I think do have value. And then there's Rods from God. I think in Adobe Reader you can rotate the PDF pages to read them sideways. So it might fit on your laptop screen but you'd have to hold it funny. As Robert says, I turn the page in Reader and stand my laptop on edge like an open book. Use the keyboard to navigate; trying to use a mouse is difficult both when rotated and then when back to normal. Come to think, on Windows you probably can hit that key combination that tells the system to treat your 1024x768 display as 768x1024 - everything turned sideways. Make sure you know the key combination to undo this. And this way, you probably can use a separate keyboard and mouse, if you like. 1977 was just before some insiders in the fusion community went public with arguments fusion was unlikely to ever be economical, even if the plasma physics could be made to work. Lidsky's article in Technology Review ("The Trouble With Fusion") came out in 1983, and Pfirsch and Schmitter's critique appeared in the more technical literature about the same time. The reason is simple: fuel rods in a fission reactor are about 1cm in diameter, but a fusion plasma is meters in diameter. Therefore for equal volumetric power density the power/area at the wall of a fusion reactor will be extremely high compared to that at the wall of a fuel rod in a fission reactor. In practice, this means engineering limits will make the volumetric power density of a fusion reactor unacceptably low. ITER's plasma, assuming ITER works, will have a power density of 0.6 MW/m^3. The power density of a PWR core is about 100 MW/m^3. 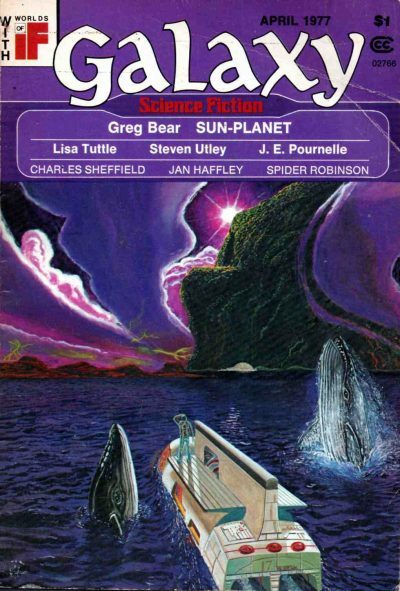 I seem to remember Greg Bear apologizing in a later issue for the quality of his "Sun-Planet" artwork. The cover is not so bad, but I remember the title-page illustration as pretty dire.